Help connecting to resources to individuals and families living with ALS. The chapter has a loan closet full of items such as wheelchairs, speech devices, walkers and other equipment. Please click here to fill out equipment request form. Patient services will contact you upon review of form and availability of equipment requested. All equipment in the loan closet is free of charge for all ALS patients. Even if you are waiting for an item through insurance feel free to borrow whatever we have until yours arrives. If you have no insurance or limited insurance, our equipment pool may hold the very piece of used equipment you need. Medical terms can sometimes be hard to understand. Click the link below to get familiar with everyday terms and phrases. Finding ways to navigate ALS can be difficult. We know how important it is to feel comfortable in your home while living with ALS. We made a quick and easy go to guide to help you choose which local care service providers work best for your loved one. 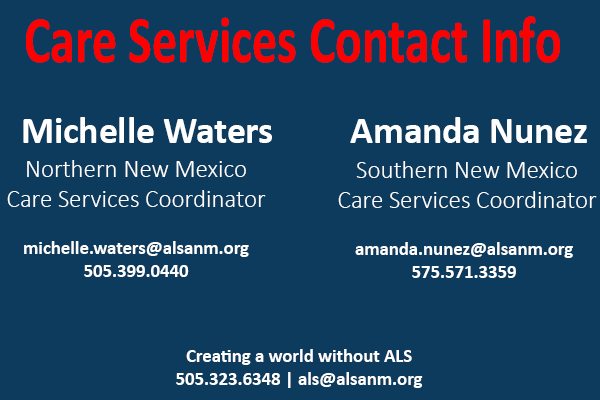 Registered members of The ALS Association New Mexico Chapter are encourage to apply for a Respite Care Grant. Our Respite Care Grant program is designed to provide much needed support to primary caregivers of individuals living with ALS. A one time $1000 grant can be applied for each calendar year to help defer some of the costs associated with hiring outside care for respite. We have partnered with various local healthcare companies to provides services. To apply please read and complete the application. We look forward to supporting you and your family. There are various companies that provide funding for those living with ALS. Click the link below to apply. If you would like to donate to the Respite Care Program. Please click below.